As I mentioned in the last newsletter, I spent a good portion of the beginning of July enjoying some time with family and friends in Tennessee. While most of you were trying to keep your head above water from the rains (more later on that), I spent a few days in Tennessee wearing pants, especially on the 4th when the high temperature that day only reached 70˚F. I may have been born in Maryland, but after 18 years in Florida, my 'blood has thinned' and- much to the amusement of my family- that was just a bit too cool in July for me. 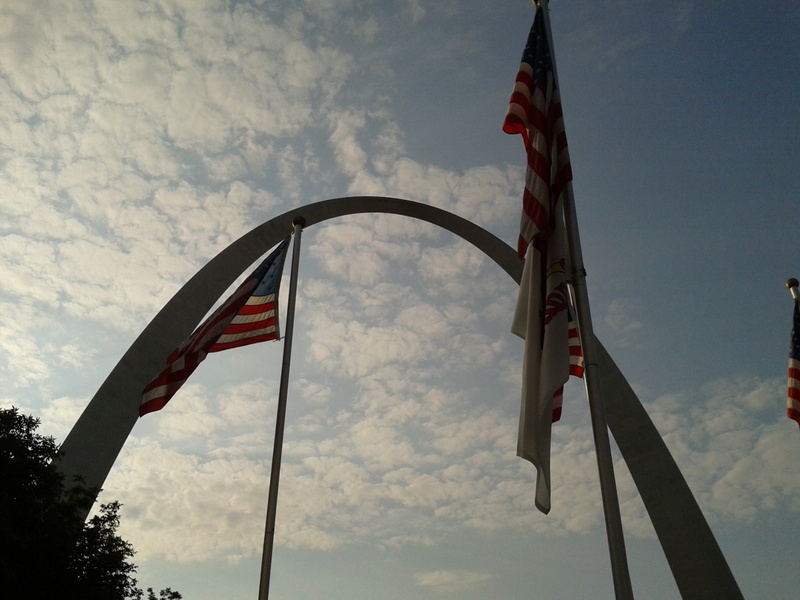 After the 4th of July, I boarded a plane and headed off to St. Louis, MO for the annual meeting of the American Association of State Climatologists. The meeting highlights the collaborative work done by state climatologists, regional climate centers and federal partners (NWS, NOAA) with climate data to create everything from tools that provide frost and freeze guidance to submitting a region-wide, multi-agency report on the 2012 Midwestern Drought. 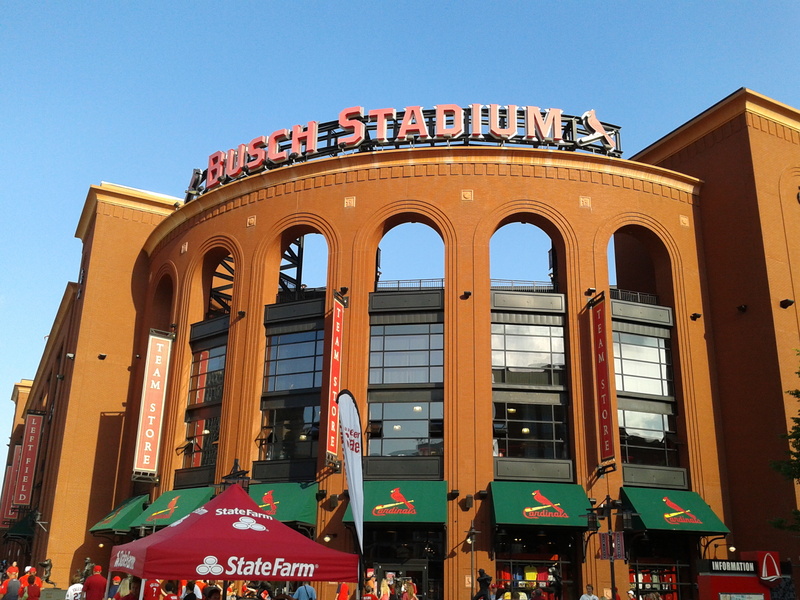 The weather in St. Louis was fantastic and I was able to spend a day before the meeting touring the city- and yes, I even managed to catch a Cardinals game. Rainfall totals across the state varied in July, though most of the state reported above normal precipitation for the month (Table 1). 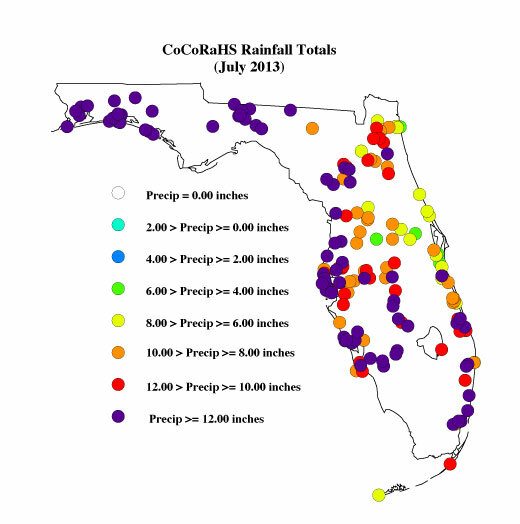 Portions of the Big Bend, Panhandle and southern Florida recorded up to 8 inches above normal precipitation while portions along the east coast from Jacksonville to Titusville and inland from the Orlando to the west coast between 1 to 3 inches below normal rainfall (Figure 1). 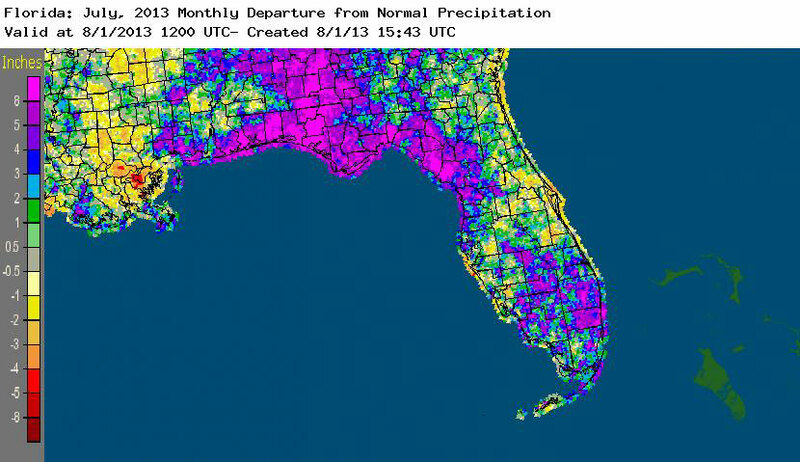 The unusual rainfall pattern during the month has impacted agricultural producers with diseases, standing water and decaying crops to causing a forced release of the high water in Lake Okeechobee to keep the lake at a level that can be managed in the event of any tropical storm/hurricane impacts later in the season. 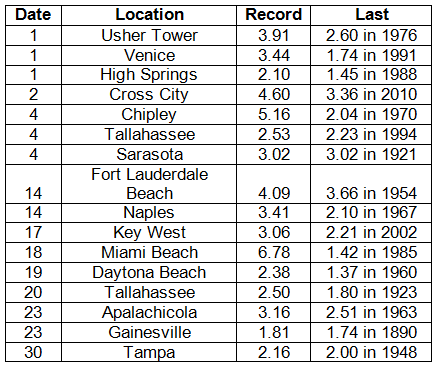 July 2013 was the wettest on record in Gainesville, 3rd wettest in Pensacola, 5th wettest in Miami and 9th wettest in Tallahassee. Numerous 24-hour precipitation records were broken for the month, with one record that dated back to 1890 (Table 2). Table 2. Select daily rainfall records (inches) broken during July (compiled from NOAA, NWS). That's about all I can say when I looked back over the month and tried to summarize all of the rain that fell in 31 days. I pulled up a quick report from the CoCoRaHS 'View Data' Page and took a quick glance at the monthly totals for those stations that reported daily values for each day in July. The lowest total I found was 4.79" at FL-LK-3 (Groveland) and the highest was 27.76" at FL-WT-14 (Inlet Beach). The dry conditions that had lingered in the Panhandle at the beginning of July were completely removed after an unusual atmospheric weather pattern allowed for an extremely moist flow over the state. 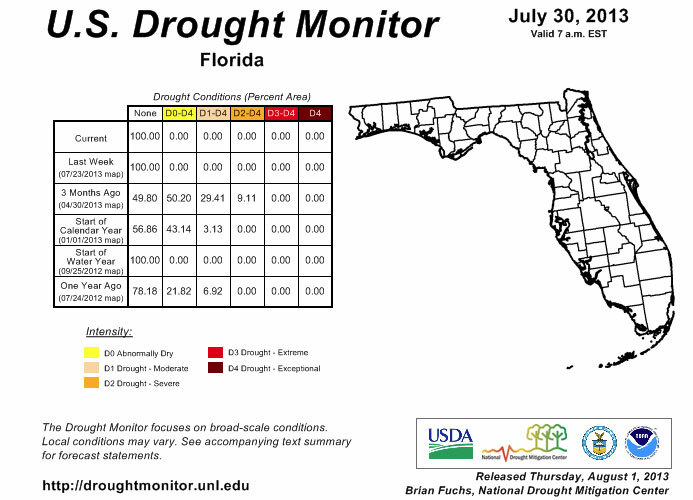 Rainfall totals for the month (Table 2 and Figure 1) were well above normal across Florida, wiping out all the remaining traces of drought conditions in the state. With all of the rain, interests have shifted from a drought focus, to inland flooding as many rivers in the state are near flood stage. The current wet pattern is forecasted to hold through October, which should keep any drought conditions that appear localized and not severe. A few reports in Florida were flagged and required some additional information during July. I appreciate how understanding the contacted observers were, along with how quick they were to reply to my emails, though there are a few outstanding issues that need to be resolved. Please remember: if you receive an email from me with the subject line 'Question About Your Recent CoCoRaHS Observation', please take a moment to answer me back. And if you have any questions, please feel free to contact me.